To relax ourselves from hustle and bustle of city life, we decided to visit one of the best vineyard in the lap of India's wine capital - Nashik. Sula Vineyards took us on a heavenly journey amidst the luxury of Indian wines. Discovering the richness and legacy of this reputed vineyard, spread across 3000 acres was an absolute treat for us being wine lovers and diving our wine thirsty soul deep into the juicy grapes with zest and zeal was nothing short of a phenomenal experience! Sula Vineyards was established in the year 1999 and it is considered to be Nashik's first ever winery at global standards. It opened the floodgates to the many vineyards in Nashik, which followed the suit. Sula Vineyards is mainly responsible for the emergence of Nashik as the wine capital of India. It symbolizes the rich heritage of wines in India - the reason why it is India's leading wine company, which has spread its roots worldwide over years. About 80% of India's total wine is produced at Sula Vineyards, thanks to Nashik's climate - which provides the most favorable conditions for growth of quality grapes. 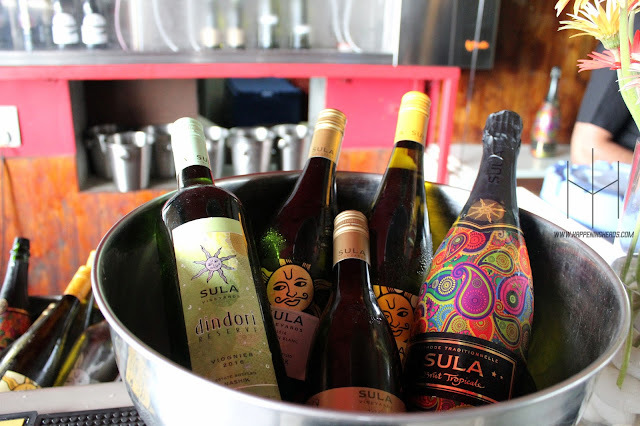 Sula prefers the latest in viticulture innovation and technology to make India's finest wines. It has been over 16 years and Sula Vineyards is ruling the Indian wine market like a boss with their 23 enticing wines. The way Sula keeps on innovating and producing new range of wines is simply commendable. Zinfandel Rosé, Brut and Brut Tropicale are some of our personal recommendations from Sula's sublime range of wines. Sula Vineyards offers a variety of stuff to make the most of. You can explore the vineyard thoroughly with the tours arrange here every 45 mins. From morning till evening. You can also taste the tempting Sula Wines at the tasting center, beneath the greenery of vineyards. There are couple of dining options available at Sula in the form of Little Italy Restaurant and Soma Restaurant, where you can dine as per your requirement. You can visit the Sula Vineyards almost any time of the year but we would recommend you to visit it during its trademarked Sula Fest, which is celebrated every year in order to deliver a happening experience which is bound to charge you up with awesomeness! Don't forget to visit Sula Vineyards' Website, Facebook Page and Twitter Handle to know more about them.